Liverpool defender Virgil van Dijk. 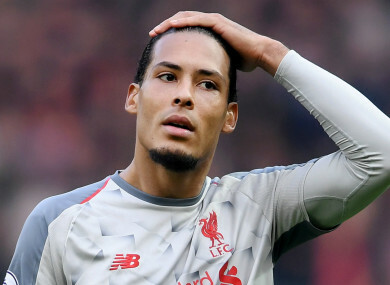 VIRGIL VAN DIJK will enter Liverpool’s crunch Premier League run-in knowing the true meaning of life and death. The Netherlands international underwent surgery on a burst appendix in 2012 during his spell at Groningen. Van Dijk’s mother Ruby was informed that only his fine fitness saw him pull through the ordeal. Due in part to a poor diet, the issue occurred before a key derby against Heerenveen which forced him to spend 13 nights in a hospital before going under the knife. In January 2018, he completed a world record €87m transfer to Liverpool and is now regarded as one of the best defenders in the world — a far cry from the situation he faced seven years ago. “I looked death in the eye — and it was a terrible experience,” he told The Mirror. “For the first time in my life, football meant nothing to me. It was not important at all. This was all about trying to stay alive. The surgery had a dramatic impact on Van Dijk, who was bedridden for several days and was immobile thereafter, barely able to walk. He would spend another year in the Netherlands before moving to Celtic, where he began to make waves in the sport. Speaking to BBC Sport earlier this month, he commented on the episode: “I put the TV on and a song came on — Viva la Vida by Coldplay, it was an emotional moment. If I hear it now I think of the tough moments and how good it is right now and how proud I can be. Email “'I looked death in the eye' - Van Dijk recalls life-threatening appendix problem”. Feedback on “'I looked death in the eye' - Van Dijk recalls life-threatening appendix problem”.